AF3 - a fast little 16' sharpie skiff with a cuddy cabin designed by Jim Michalak (My current Boat). It has one sail with two reefs. 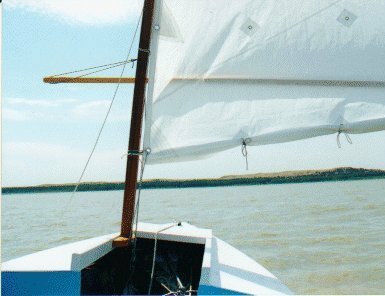 It took me about 170 hours to build the boat and sew the sail. My family and I recently took her out for a weekend in steady 25 knot winds and had a wonderful time with no worries. We had one reef tied in the whole time, sailing beam reaches or broad reaches. We would have had to tie a second reef in if we had needed to head upwind. It was nice to know we could get home even if the wind shifted. Jim Michalak recently mentioned in one of his excellent essays that force on a sail is proportional to the square of the wind velocity. If the wind doubles from 5 to 10 knots, the force on the sail will increase by four times. This is the reason why reefing is so important. I found a description of a Scotland "Fifie" in John Leather's "Spritsails and Lugsails." It was used for fishing along the North Sea coast of Scotland around 1905 and had eight lines of reef points on the main and five on the mizzen. 1. 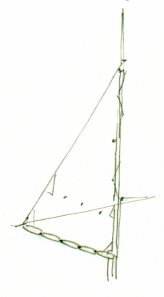 Full sail 2. single reef main 3. furl jib 20% 4. double reef main 5. furl jib 50% 6. drop main OR furl jib and mizzen 7. mizzen only (downwind only). Sometimes I heave-to to wait out squalls instead of running with the wind or heading in to shelter. 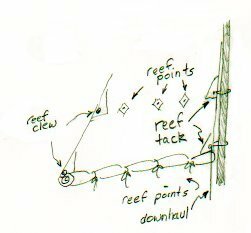 To reef, I lower the sail completely, remove the sprit boom, free the downhaul and re-lace it to the first reef tack. Then I the tie the reef points starting with the one farthest from the ends going inward, refasten the sprit boom and raise the sail. I haven't had boat for very long, so I don't have much practice, but so far the whole operation takes about five minutes - about twice as long as on the Drascombe. I'd like to get it down to two and a half minutes, so I plan on adding a few clips or shackles and other features to sprit boom and mainsheet to make things go faster. I think the ability to effectively manage sail area, regardless of rig type, is a fundamental part of sailing and seamanship. For small boats, I prefer simple sail rigs with few moving parts. 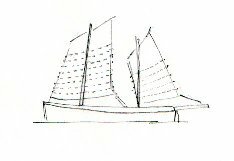 I have only recently started reading about the pre-industrial sail powered fishing boats, but I have learned a lot by simply studying their rigs.